Only 12 days to breakaway for the NGSPA Amateur National Championship! Entries are pretty much complete and we have 45 Amateur dogs, 27 in the Futurity, 24 in the National Championship and 54 in the Shooting dog Championship. I say pretty much complete because we may still receive a few entries for dogs qualifying to run after the official closing date, February 3, 2015. 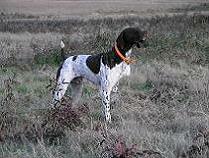 In fact, we have already received one such entry, HK’s Trilogy, that qualified in Freer, TX last weekend! Congratulations to David and Hayley Killam the owners and Eldon Hongo, handler. Entries are right at the same level as they have been in the past few years except the Futurity is down. The schedule of activities listed below should still be an accurate prediction of how things will go baring weather or other unforeseen problems. ** Note: Starting times and dates will be adhered to as much as possible. However, weather and other unforeseen circumstances may require adjustments. Any changes will be announced in the Clubhouse. The weather here in Booneville is still sunny and clear. The roads are clear and dry at present, however, there is some freezing rain predicted for late this evening and early on Friday morning – be careful! The bad news is that the forecast for Friday night and all day Saturday continues to be terrible. Cold rain is predicted during the night Friday and 100% chance of rain and thunderstorms all day Saturday. As a result I am making the decision to delay the start of The Amateur National Championship by 24 hours until 8:00 AM Sunday, February 22, 2015. The Amateur drawing for running order will still be held Friday evening February 20, 2015 and all other meetings, dinners, etc. will be held as previously scheduled. Be safe driving to each of the Nationals that are going on the next few weeks. AF Nationals, AKC Gun Dog Nationals, And NGSPCA Nationals. Just out of curiosity what do the winners of those classes win for champion and runner up? Does anyone have the running order? Amateur will be a specific prize, like a saddle or something. Open stakes will be trophy and cash prize, 1,000 to winner and 500 to runner up plus trophy. Futurity will be money put into the futurity fund plus trophies. Trophy for amateur as well. Just heard the AKC Gun Dog Nats was cancelled for this year. Pros will have easier time betting to Booneville for Shooting Dog. jcabrera wrote: Does anyone have the running order? They do the drawing for running order the evening before the start of that stake. Amateur Shooting Dog Running order. I see the running order has already been poster - thanks! Brace 1 got off at 8:00 AM this morning just 24 hours behind schedule. The Judges, Fred Smith and Randy Hopkins will be posting dogs-of-the day and I will try to find time to get them posted. Are there favorites in the Futurity, shooting dog and all age? I am going to go to this trial next year to take In the fun. Six braces completed. The visibility in brace six dropped to the point where the judges asked Frank Verrt to pull the tracker and pick his dog (Tulli's Cajan Mojo) up for safety. The judges were liking the dog's performance and the dog will be re-braced with the bye dog in the last brace of the stake. Snow has stopped and we expect to be able to resume running at 8:00 AM tomorrow. Brace 7 broke away at 8:00 AM. Temps were and continue to be in the mid-twentys. Braces 8 & 9 each had a scratch and the Judges elected to run the two remaining dogs in the second morning brace. Bird finding was tough with scouts reporting the birds holding tight in heavy cover. As a result, three braces were finished before snow canceled the afternoon running. Snow build-up on the horses hooves and decreased visibility contributed to the decision. The snow is supposed to stop by mid-afternoon and we expect to resume running tomorrow morning. The weather tomorrow and Wednesday is looking pretty good and we should be able to complete the NGSPA Amateur National Shooting Dog Championship by Wednesday evening. If that holds true, the Futurity will start Thursday Morning. Hope the weather turns for the better & all get a fair chance.Be safe every one & good luck to all! Thanks for the up to date info. direct from the source. I was pulling info from others from facebook. Know everyone is busy there and weather usually becomes a challenge, wether ice or 70 degrees. Any idea which 2 dogs were scratched? Messer ' s Moto female and Jody Orndorff's Duke male yesterday's DOD. Futurity starts at 8:00 AM tomorrow. 3rd Place is HK's Lean Louis "Louis". Owned by David & Hayley Killam, handled by Eldon Hongo. 1st 3 braces of All Age and no birds pointed. Been hearing birds are very hard to come by. Very deep in cover, then lost dogs on point. Wish best of luck to all who stick it out. 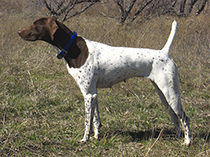 All 6 braces of dogs went bird less on the first day of the National Championship (All Age) yesterday. Riding conditions this morning are unsafe and we have cancelled running for the day - snowing with 1-2 inches accumulation expected. Weather conditions are the worst anyone can remember and the forecast is calling for rain, snow or a mix of the two for the next week. Bird finding has been the worst I have seen here with numerous dogs going bird less or suffering multiple nonproductives. Scouts report seeing birds deep in heavy cover but the scenting conditions have been horrible. Just heard they have two braces of AA to run in the morning. The shooting dog drawing is tonight. Owner: James Messer and Sara Messer; Handler: James! Any news on how far along OSD is? Started brace 14 after lunch today. Heard that's its been raining hard and supposed to change over to snow and this afternoon and tonight. They were supposed to start brace 11 this morning not sure if their was a delay or not. They did run today last I heard 13 braces & still running. Heard they only ran 2 braces this afternoon. As the start of 3rd brace one of the judges slipped and judge was thrown. They called it for the day. NGSPA OSD Nationals are delayed again. We have ice and 2-4" of snow. Say we'll start up at 9am but looks and feels pretty slick to us. Bright side is the sun is shining brightly already which is nice to see for a change. starting with 16 when they get started but now not starting at 9 am due to being to slick. Waiting to see what happens. Delay again for another day. Snow melting, but will start in the am maybe. Out of curiosity and as a novice, what is the likely hood of a futurity winner winning the AA or OSD in the future? I am sure you never know, but I did A VERY LIMITED amount of research and saw some futurity winners that seemed to fall off the earth. Friday, March 6, 2015. After losing all of yesterday due to ice and snow making conditions too dangerous to run, today dawned clear and sunny! We finished 6 braces and should finish the National Shooting Dog Championship tomorrow (5 braces still to go). It has been a tough slog contending with the worst conditions in the 28 years the NGSPA National Championships have been held in Booneville. Rain, freezing rain, sleet, snow, fog and a tiny bit of sunshine. Congratulations to Chris and Josh and the owners, real good. Especially happy for Josh. Great stuff coming.